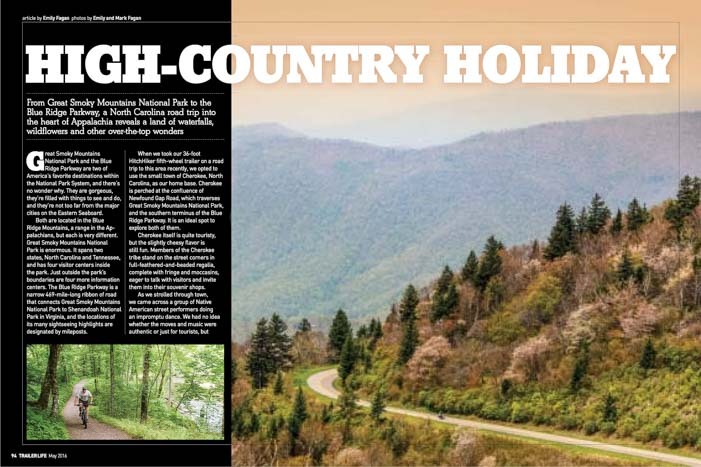 Great Smoky Mountains National Park – in Trailer Life Magazine! The May, 2016, issue of Trailer Life Magazine features our article about our RV roadtrip through North Carolina, starting with Great Smoky Mountains National Park and then going up the southern half of the Blue Ridge Parkway. We visited the area in the spring and absolutely loved it. 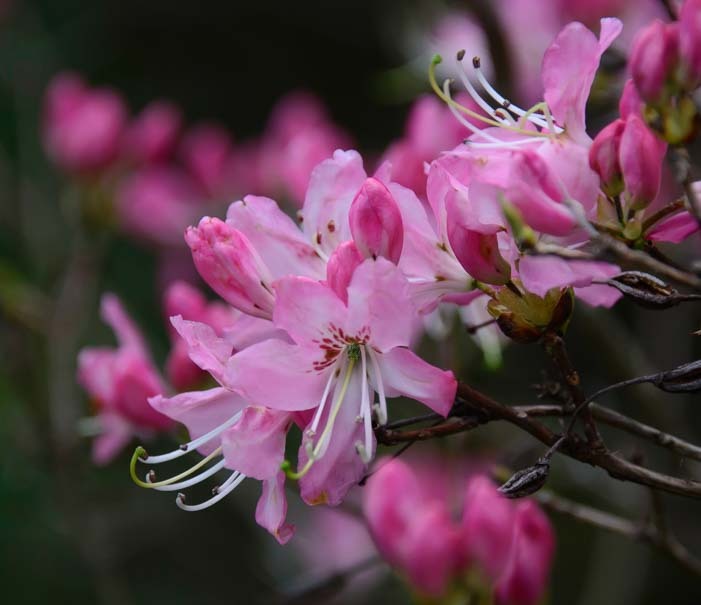 When we started our journey, the wild rhododendrons were just beginning to bloom. As we made our way north, they continued to be at their peak in each area we visited! 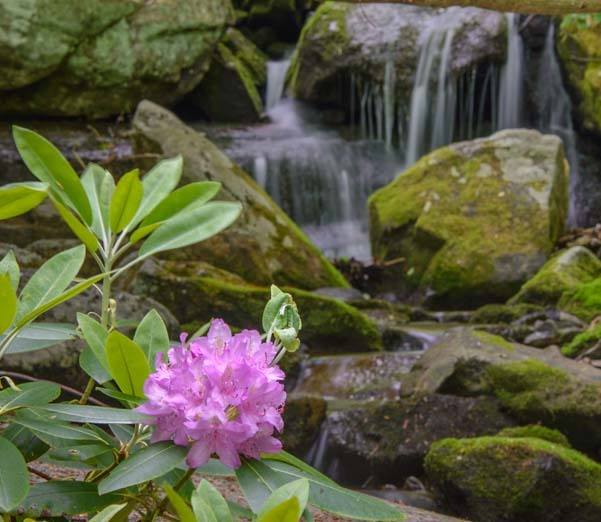 Rhododendrons bloom everywhere in the Smokies and Blue Ridge Mountains! 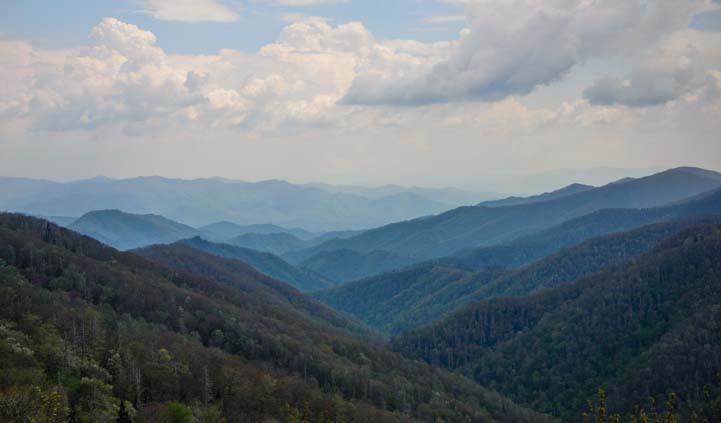 Great Smoky Mountains National Park is so big that it spans two states: North Carolina and Tennessee. We stayed on the North Carolina side, saving the Tennessee side for a future visit. 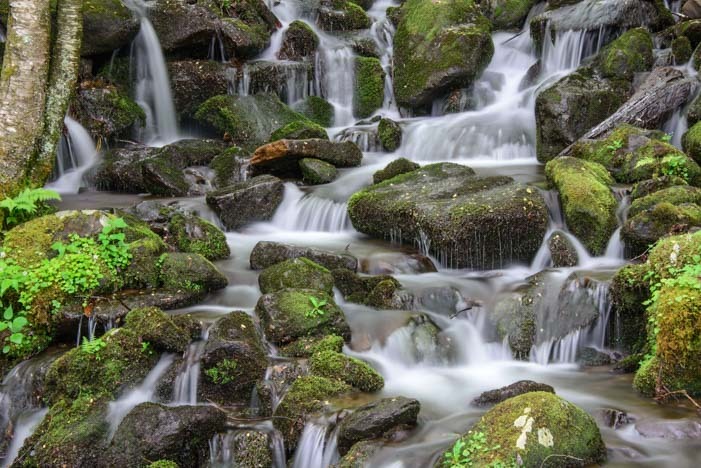 The town of Cherokee is an excellent place to use as a base camp for exploring both Great Smoky Mountains National Park and the Blue Ridge Parkway, and we got a kick out of the town itself, even though it’s very touristy with a slightly cheesy flair. From there, we bee-bopped on and off the Blue Ridge Parkway heading north. 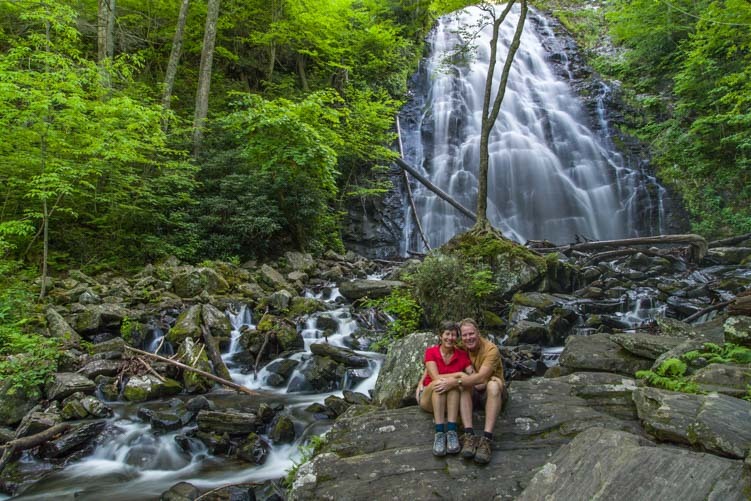 We discovered that waterfalls are abundant in Great Smoky Mountains National Park and also on the Blue Ridge Parkway, so we quickly made “waterfall hunting” the theme for our travels. There are a few low tunnels at the south end of the Blue Ridge Parkway that a tall RV like our fifth wheel trailer can’t sneak through, but the rest of the Parkway is easily driven by any size RV. A motorhome zips along on the Blue Ridge Parkway. 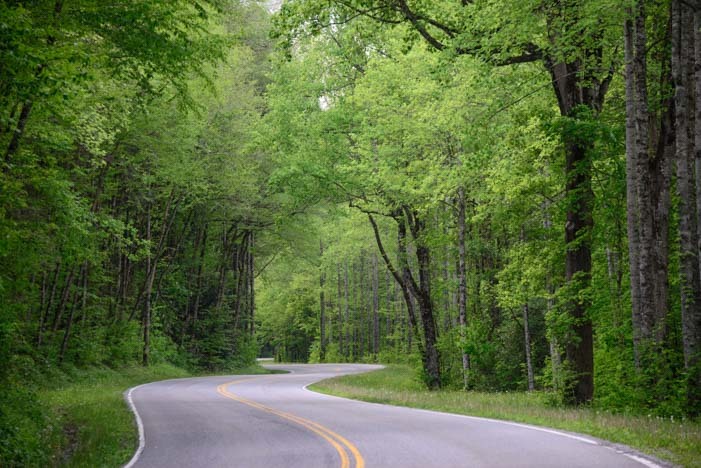 Much of the Parkway itself, although lovely, can get a little monotonous after a while because it is a skinny, winding road that snakes under a canopy of trees for much of its length, with little to see but greenery. Many of the scenic vistas and overlooks have become overgrown by tall trees over time, so sometimes there is no view at all! However, the small roads that zig-zag around and across the Blue Ridge Parkway are fascinating, because they give a glimpse of life in the Appalachian Mountains with homes and businesses owned by the locals. So, we traveled on these roads for the most part and just sampled the Blue Ridge Parkway here and there when there was a landmark, like a waterfall, that we wanted to see. Sometimes readers ask us what the best way is to find out about great RVing destinations or how to pick up tips about the RV lifestyle. Being a little old fashioned, I always recommend subscribing to a magazine or two, whether in print or digital form. As soon as we bought our first popup tent trailer, we subscribed to Trailer Life Magazine. When each issue arrived, I would dive into the destination articles, dreaming of our big escape, while Mark would always scour the technical articles, looking for pointers about how to care for our new little buggy (or bigger buggies we might grow into someday). 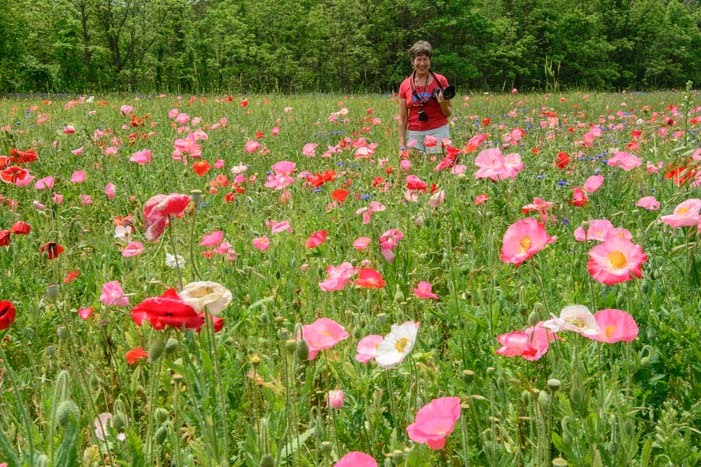 Thigh deep in a field of wildflowers in North Carolina! Beginning in my twenties, I subscribed to various RVing and sailing magazines. They fed my wanderlust and kept my dreams alive when the only view I saw most days was my cubicle walls. I’m proud now to write for all the magazines that used to be my sources of inspiration back when they arrived in my mailbox years ago. Hopefully the tech tips and travel stories I write for them now will encourage and inspire future travelers. 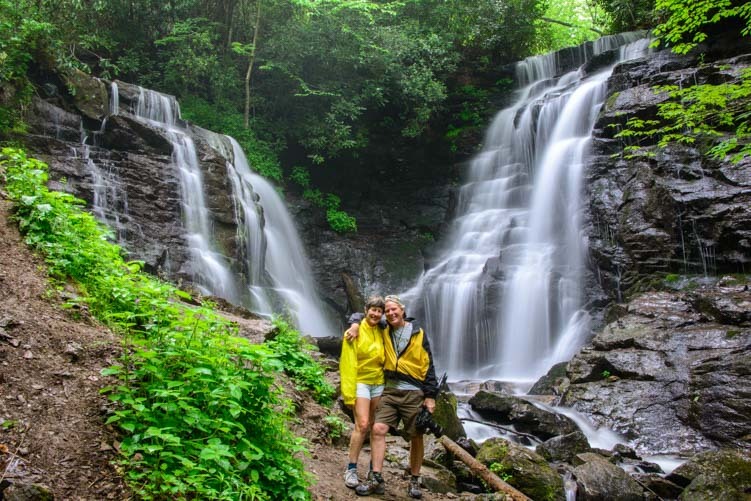 If your RV travels will be taking you on a north-south route through North Carolina this year, a very enjoyable way to navigate is to follow the Blue Ridge Parkway and do a little exploring at Great Smoky Mountains National Park! This entry was posted in North Carolina and tagged New, News, Non-Travel by Roads Less Traveled. Bookmark the permalink. Congratulations on your latest article! …..did you tow your 5er through the parkway? Thanks, Curt. No, we didn’t tow the fiver on the parkway, but it can be done, as long as you avoid the first few tunnels at the south end.